If I've got a crazy busy day ahead of me and know I will not have time during the 4 o'clock hour to start preparing dinner, I pull out my crock pot for support. I don't have a huge repertoire of crock pot recipes but this one is a favorite by far. Although I made these yesterday...today is one of those crazy busy days so although the photos are mine, the recipe is all Epicurious.com. The recipe was originally published in Bon Appetit Magazine in June 2002. Put the first 11 ingredients into the crock pot and stir well. Add in the pork chunks, cover and cook on the low setting on your crock pot for 6-8 hours. Take pork chunks out and with a knife and fork, and shred on a cutting board. Add shredded pork back into the crock pot to soak up the juices. Make lemon sauce with mayonnaise and lemon juice to your taste. Take the lavash bread or tortillas and spread a little lemon sauce on. 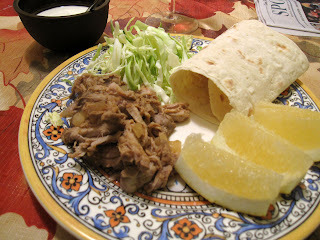 Then add a little pile of shredded pork to fit the lavash/tortilla. Top with shredded cabbage (or not) and then roll up. I also serve it buffet style where each element is on the plate and one can make their own roll up. For more details visit here for a more detailed version of this recipe. I'm linking up with Debbie at her Tuesday at the Table feature - please visit to see what others are serving at their table. I'm off to continue on with my day but first ~ The warmest of wishes for two special friends who have birthday’s today- Buon Compleanno! I'm not a huge crock-pot user, but would like to be more. I will definitely be trying this - sounds fantastic & hubby would love it! This sounds great, Susan! I definitely need to add more crock-pot recipes to my repertoire. The lemon-mayo is an interesting touch. I was just thinking about you and your lemon tree the other day while bemoaning my lack of lemons in the house! I love my crockpot. Have you tried baked apples in your crockpot? Yum! Oh my goodness, this sounds yummy! I may have to make this one soon! That recipe looks delicious! It's a long time since I've slow cooked pork like that so I'll have to try it soon. And I couldn't help looking at your previous post too - the quilt along blocks are really stunning!